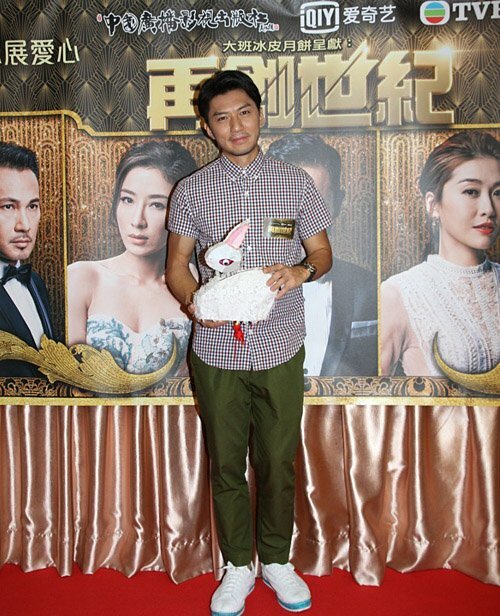 Roger Kwok (郭晉安), Tavia Yeung (楊怡), and Benjamin Yuen (袁偉豪) were at an event to promote their new drama, Another Era <再創世紀>. Since the ending has already been aired in Mainland China, spoilers have been afloat and the characters’ endings are of no surprise. Tavia laughed and recalled a time when she almost accidentally stabbed veteran actor Chun Wong (秦煌) while they were on set to film Face to Fate <布衣神相>. Bored while waiting around to film her scenes, she randomly picked up a real sword and started stabbing a pile of stuffed hemp bags. A while later, she noticed that there was a large belly sticking out from among the pile of bags and realized it was Chun Wong sleeping. He was wearing hemp clothing and blended in with the bags. This drama has the potential, but too bad TVB didn’t want to take the efforts to slowly develop the story and characters like Mainland series do. Since this series is a collaboration with Mainland, why can’t TVB produced up to 40-50 episodes? After all, they should have the budget to produce a longer series with the collaboration production. Besides, i think the censored version also somehow affect the flow of the original story. For example, when i watched the iQiyi version, the scene where Benjamin broke up with Niki for the first time was deleted, so i was blur when it was told in later episode that they have broken up because i’ve not watch that scene until i happened to watch it when my family was watching the TVB original version. @diana80 Uhm, I don’t want TVB to follow mainland route of slowly develop the characters! Cdrama has way too much drags, that kid me not, but I would avoid modern cdrama like a plague! @diana80 Sometime it is quality over quantity. I would rather a shorter series that is well paced than a longer series with a lot of filler material. The story has potential but there are too many side characters. Roger and Tavia are the most interesting characters in the series with a lot of potential for backstory. I wish the script had put more thought into developing the deterioration of their relationship rather than rushing it to all of a sudden turn of mistrust to end the drama. And even if they mentioned more of how they suffered as the underlings of the rich and elite and their rags to riches story would be great as well. I thought the ending was quite strange and rushed. And Leo (Roger) didn’t have a stroke. Pakho’s character is very annoying.